When the crockpot girl, my lady love, requested to have a friend in need over for dinner and liquid comfort, I took it upon myself to create a dish that would delight their tastebuds, ease their minds and soothe their troubled spirits all in one bite. Living with a lady for the past year, I’ve learned several things – when things accidentally break and mysteriously disappear, it’s probably her, keep your mouth shut; wine always wins; make up the bed before leaving for the day; and when friends are need, serve something fancy. I whisked together this “delightful little,” as my wife would describe it, “salad,” as I would simply say all gruff and masculine clutching my biggest, sharpest knives close to my chest with a piercing look of authority. But I’m getting sidetracked. Back to this female wooing collection of seafood and greens… I shopped our fridge and found a block of Honey Goat Milk Gouda cheese. some leftover crockpot cilantro black beans, and champagne vinegar, an Arey kitchen staple, and built the rest at the grocery store. Fresh tuna, bay scallops and artisan greens became the stars of the show. Mix juice from lemons and limes with mix shallots, olive oil, salt and pepper in a small bowl. Add scallops and allow to soak for an hour. The acid will effectively cook the scallops and be ready for devouring. Lay greens out in whatever artistic display you prefer. Splash with champagne vinegar, drizzle more olive oil over top. Dust with salt and pepper. Thinly slice cheese and lay on greens. 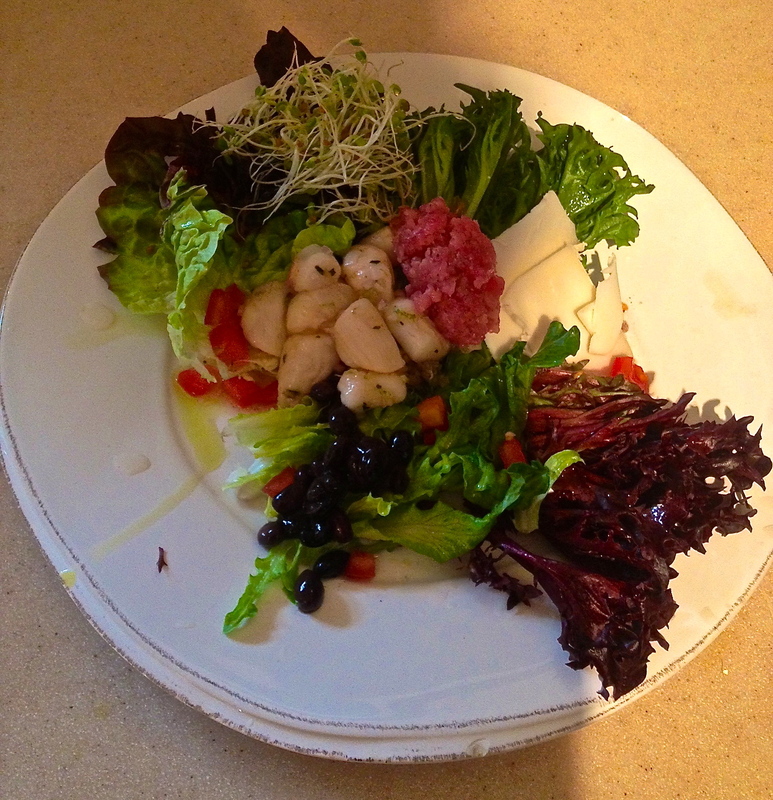 Top with diced tomatoes, black beans and scoops of ceviche scallops and seasoned tuna. Wow the ladies.